Well I can't think of a single album actually. However I did pre-order Echobellys new record on Pledge Music, and Liam Gallaghers new record is sure to be what has been missing from Oasis over more recent years. So, apart from that, not much else. Wow, so it's not just me! For the first time in my life, I am struggling trying to find any new music at all that knocks me out. I've listened to a bunch of new stuff recently, but nothing that has had any staying power at all with me, either by new or established artists. I did listen to the recent Real Estate album, and although I think it's the best stuff I've heard from them, they still don't knock me out. The new album by the Feelies, who are in some ways Real Estate's New Jersey ancestors, is well worth hearing, so I guess that is the sole item on my list at the moment. Although I wouldn't say it's knocking me out, more like if you liked the Feelies 30 years ago, you'll like this one too. A bit pastoral for them though. Well I would not remember The Feelies because 30 years ago was 1987 and I was just being born then. My earlier music memories would probably be Crowded House's Weather with you actually funnily enough around when I was 4, so that was 1991, on the radio and Icehouse who put the writing on the wall. That is the earliest songs I remember. And about music not knocking you out? What do you mean by that exactly? It knocks me out all the time, because its so bad. The Killers and that new zealand band Pluto (great name - after the dog from 100 dalmations and the planet?) were on the radio here 10 years ago or just over and it was the most dull dreary depressing nonsense ever. Its to bad Neil hasn't made a rock album with 12 Locked Outs on it, to squash it all. That is what was needed back in 2005. I don't know about music, but I feel its been so stifled and commercial for so long something will change with radio and the music industry very soon! Because it needs to start making profitable money again, otherwise no one is gonna want to be involved in it and music will die. And no new bands will ever come along. Nothing after captures my imagination in anyway whatsoever. Nobody writes proper songs anymore they just write laid back wish washy stuff. No proper chorus, or versus and rhyming is the devil as far as most songwriters are concerned today. Music that knocks me out is music that blows my mind in a very good way. Not sure if that misunderstanding is a cultural one or a generational one. Of course there is the odd song from different releases that if it made up more of the radio playlist then the world would be a much more optimistic place. Neil Finns last album comes to mind which I did not hear on the radio at all, but New Zealand has had all its radio stations taken over by corporations now and big network giants with sharp claws. So I hope now with the luxury of the internet (which you didn't need so much years ago) perhaps a movement with that might grab peoples attention. I think of 1995 as the last real great year for music mainly because of the following reasons Oasis and Crowded House, but Oasis messed up their 3rd album and Crowded House ended a year later so.....to me that was the last great year for SONGS. The only album from this year that has "knocked me out" is the new Aimee Mann album. It may not reach the God-like heights on her peak albums (Bachleor #2 and Whatever) but it has freaking brilliant songs that only elite songwriters like her and Neil Finn can write. Here's the video to the song "Patient Zero". The new album 'Fierce Mercy' by Colin Hay is stunning. I wish Atlanta was on Aimee's tour. Have been a fan of hers for a long time, but have never taken the opportunity to see her play live. Actually because I am really rocknroll........and love alternative rock, Bush's new album Black and white rainbows has been released. I became suspicious about Gavin Rossdale, but I assume he is an alright kind of person. Maybe he just gets bad press and makes him look bad. Still anyone successful in the music industry can be exposed to the darkside, and I don't mean, orgies and drugs....(....) I mean black magic and eating children. For all you Sufjan Stevens fans ... his team just posted the entire live "Carrie & Lowell" concert on his Vimeo page below ... enjoy! Personal taste always amazes me. I'm listening to Meg Macs new album atm. So young yet so deep. Real is the word I'm looking for. Too many fakes out there with no depth. Sufjan Stevens just posted the entire video of his new live album "Carrie & Lowell Live" on YouTube. It is incredible and well worth the 90 minutes to watch it and soak up its beauty. See below. 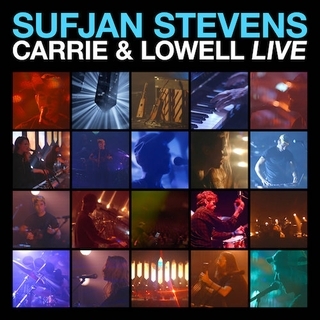 Also, I thought the cover artwork is a little similar to the first 7 Worlds Collide live album... Maybe Sufjan is a Finn fan?? :-) That would be a very interesting collaboration! I am totally in schock to be saying this, but the Harry Styles album has been on endless repeat in my car for the last week. I just can't get enough of it. Andy White's Imaginary Lovers- truly excellent, am in awe at a few of the tracks on Blondie's Pollinator -especially the Joan Jett backing vocals- a bit of guts..the Johnny Marr penned track on the album is ok too. Really digging Grizzly bear's Painted ruins and Alt-J's relaxer. And Neils album off course. Really enjoying the live Replacements album For Sale: Live at Maxwell's 1986 that came out about a week ago. Fans of all things Finn should check out the brand new album by 22 year old Julien Baker. It's a big wow. Similar in style to Out of Silence with powerful emotions, strings, simple instrumentation etc. Sort of Lisa Germano meets Radiohead. I could absolutely see her performing/recording with Neil Finn. Enjoy! Fans of all things Finn should check out the brand new album by 22 year old Julien Baker. It's a big wow. Similar in style to Out of Silence with powerful emotions, strings, simple instrumentation etc. Sort of Lisa Germano meets Radiohead. I just watched the 3 songs from the CBS Saturday Sessions and was blown away. Her voice is very powerful yet sweet and reminds me of Bjork. Musically, I can't think of anyone she reminds me of. Thanks for posting! I thought Tori Amos when I first heard her due to her quiet intensity where she sounds like the music is about the explode at any moment. But I agree that she has an original sound which is nice to see in 2017 where most music blends together. I can't believe the year is winding down. Here are my current top 25 albums of 2017 ... and I adore all twenty-five of these extraordinary albums. YouTube clips for each album are below. The incredible Brandi Carlile just announced her new album "By The Way, I Forgive You" ... and the first song is posted to YouTube and it's amazing. Noel Gallagher’s new album Who Built the Moon. It was only released yesterday, but I already know it’s one of the best things I’ve heard all year. It’s a little bit different, in a very good way.